While planning their wedding, a local Westchester couple never imagined their journey to find the perfect wedding favor for their guests would lead them to start their own small business. The newlyweds discovered their love of cooking while dating. The entrepreneurs set out to give their wedding guests a memorable and useful gift of hand blended spices created and tested in their own kitchen. The demand for more from friends and family kept coming in and eventually they realized they were onto to something unique. 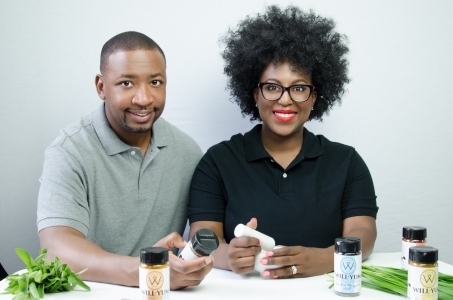 Just a few short months after tying the knot, Warren and Brandalyn Williams launched WillYUM Spice offering 4 oz. glass jars packaged with spices inspired by recipes from the grooms’ mother and the family’s native West Indian roots. After consulting with the branding experts at Hudson Valley Graphic Design in Croton a trendy logo was created incorporating the couples wedding date and a heart to symbolize their love for cooking. Warren and Brandalyn Williams work closely with several small spice distributors to ensure all WillYUM Spice products are gluten-free, all natural with no preservatives, no additional flavorings; packaged weekly to insure the freshest grind possible. The options are McKay’s Curry, Turmeric, Smoked Mesquite Salt, Red Pepper Flakes, Pepper’s Essence and Jalapeno Seasoning Salt. They are available individually as well as in sets of three or six bottles packaged nicely in a presentable gift box. Each bottle of spice includes the couple’s mission and a useful WillYUM Spice cooking tip. “We got bit by the do-it-yourself bug for our wedding favors and sought out fresh and unique spices to package for our guests,” said Brandalyn Williams, a Makeup Artist for Fox Business Network and freelance makeup artist for weddings and Broadway shows like Lion King, and Wicked. She also works as an Adjunct Professor at SUNY Purchase teaching Stage Makeup. “We saw a need for this product when our wedding guests couldn’t find the blends we gifted in stores. We also received unexpected feedback about the quality. That’s when we saw an opportunity to share this story with the world and start a business.” Warren is a Certified Surgical Technologist at Phelps Memorial Hospital in Sleepy Hollow, NY. He has always wanted to be a business owner and manages the day to day operations. In what is left in their spare time the couple focuses on running the new business and learning all they can about being entrepreneurs. The WillYUM Spice website was launched in May and customers can have the spices delivered right to their door throughout the United States and Canada. Local residents can stop by and sample WillYUM Spice products at the Tarrytown and Peekskill Farmers’ Market stands. In the upcoming months the company plans to partner with several local restaurants to showcase some of the signature WillYUM Spice recipes. “We love hearty, healthy, home cooked meals and love to experiment and build excitement in the kitchen.” added Williams. “All spices are not created equal. However, with WillYUM Spice we are giving novice and experienced chefs alike a fresh alternative for all their culinary needs and inspiring them to be creative. The gift of spice is truly the gift that keeps on giving.” Check out their website for specific Farmers’ Market dates and to order WillYUM Spices at www.willyumspice.com.